Lions and Tigers and … White Squirrels? Just what is a white squirrel, anyway? Is it a distinct species? Is it a mutation? These are some of my most FAQs. And the answer is ……. it depends. There is, in fact, one tree squirrel for which a white coat seems to be a characteristic of the entire species, at least in parts of its distribution. Its an Oriental Tree Squirrel of the genus Callosciurus (Callosciurus translates as “beautiful squirrel”) found in Thailand and other parts of South East Asia (Thorington and Ferrel, 2006). Another belongs to a yet undescribed species recently found on Palawan Island in the Philippines and thought to be endangered (for more information click here). 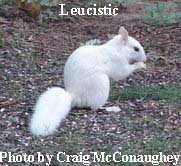 So if you sighted a white squirrel here in North America outside of captivity, its almost certainly a color variant of one of our native species of the genus Sciurus (only distantly related to Callosciurus*). In my neighborhood, that would be the Eastern Gray Squirrel (Sciurus carolinensis). Most of what follows will be in reference to that species but white coated Fox Squirrels and Red Squirrels have been sighted, as well. Note: this posting becomes increasingly technical as it progresses, comparing the possible mechanisms by which different variants may arise; if such mechanisms are not of interest to you, I think you may want to skip down and read the last three paragraphs which focus on white squirrels, again, and are, I hope, of general interest. There is much variation in squirrel coat color both locally and regionally. The general pattern of brown/gray on top and white below (counter shading) is considered the wild type from which other variations arose. These wild types, like most mammals, have dark eyes. The brown, reddish, gray, or even black color comes from the production of a pigment called melanin which, itself, comes in at least two varieties, eumelanin (black/brown) and phaeomelanin (red/yellow). Different combinations and arrangements of these two pigments produces a variety of hues. Alternating between one or the other (or neither) results in banded hairs referred to as agouti. All this variation can arise from change in either the genes that control the production and packaging of melanin itself, or of genes that control the distribution of melanin production. 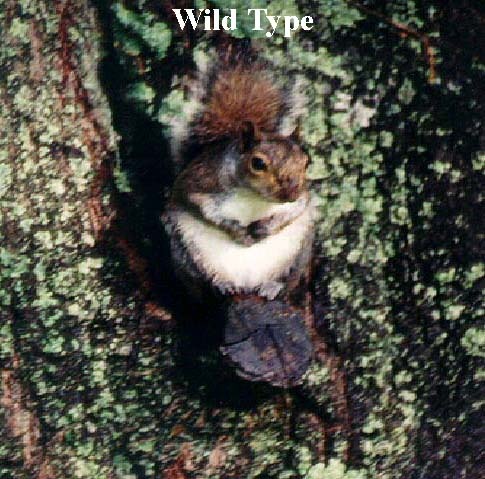 After all, most wild type gray squirrels have a white abdomen not because there are mutated genes in those cells but because there are regulatory genes which suppress the activity of melanin genes in these locations but not others (or prevent melanin producing cells called melanocytes from reaching such regions as discussed below). The white abdomen is adaptive. It makes the squirrel less visible from below against a light sky. Yet some squirrels have tan or ochre bellies (witness the now infamous Stan the rally squirrel for the 2011 St. Louis Cardinals’). Black or melanistic squirrels produce excessive amounts of melanin in comparison to the wild type and in expanded regions of the body. These variants are often found at higher latitudes and the dark color is thought to be involved in thermoregulation. The point I am making here is that while variation from wild type comes about by genetic change known as mutation, the word mutation carries a negative connotation, implying a freakish condition. In this case it produces a wealth of variation that may actually be appropriate for local conditions (including human preference). Thus, I prefer the term variant over mutant although I will use both below for variety. With that said, white squirrels are just another color variant of this very variable species. 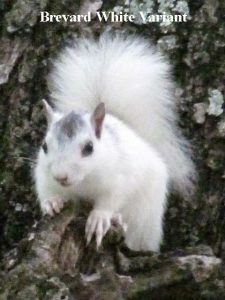 The most common sightings of white squirrels are of isolated individuals with a completely white coat but dark eyes, a condition known as leucistic. This variant (illustrated on the left) appears to spring up sporadically all over the species’ range and then dies out, only to pop up again somewhere else (see list of colonies and sighting). I think these are spontaneous mutants of some gene that delegates the use of the pigment (melanin) gene, not mutants of the melanin gene itself ( possible mechanism is suggested below). Instead of being produced in skin/hair cells and the eyes, it is only produced in the eyes. In another mutation, one in the genes that are directly responsible for producing melanin, no cells make the pigment and the squirrel is not only white but has pink or blue eyes. These true “albinos” are reported even less commonly, probably because without the eye pigment to reduce glare, their vision is impaired and they may suffer more from falls. Increased predation may also be a factor; a decline in the well monitored Olney Illinois albino population has been linked to cats. Still rarer seems to be the type of coat pattern we have here in Brevard NC. The coat is mostly white but there is a distinctive head patch and dorsal stripe that broadens in the shoulder region. The head patch can be solid, horseshoe or doughnut shaped; it may resemble a triangle, a diamond, deer tracks or even a widow’s peak (Count Dracula). There is some evidence that this pattern is inherited (Burgin: Inheritance of Head Patch). Although there is much variation in the amount of pigmentation, these white squirrels definitely can produce melanin, not just in the eyes but in hair cells as well. I’m guessing but I think the gene responsible is probably what we call a regulator gene, effecting the distribution of hair color, not color itself (although agouti and red hairs seem to be lacking). The region of white hair, normally restricted to the abdomen in a gray squirrel, is expanded at the expense of pigmented regions. A simple mechanism by which this might arise is from a shortage of melanocytes, the melanin producing cells (Dalzell, 1997). Melanocytes do not originate in the skin. Early in embryonic development, they are part of the neural crest which pinches off from the neural tube as it is about to close. These cells then migrate throughout the body where they contribute to the formation of many structures, most of which are much more vital to survival than coat color (a complete lack of neural crest cells would be lethal). Those destined to form melanocytes are called melanoblasts when immature. Their role at this stage is not to produce melanin but to migrate to the germative layers of the skin and penetrate into developing hair follicles. Another important function is to proliferate along the way. From a few dozen original cells, they will end up forming millions of mature, melanin producing melanocytes. But if something were to impede their replication, their numbers might not be sufficient to supply the entire body. Since, as mentioned above, counter shading is adaptive, we would expect the back (dorsal) areas to have priority to this limited supply. In fact, melanoblasts begin their journey in close proximity to this region of the body which would thereby get “first crack” at them, anyway. Simply retaining them near their point of origin would result in what appears to be an extended white “abdominal” region, i.e., a Brevard white squirrel! I have argued elsewhere (“Inheritance: Dominant or Recessive?”) that this predisposition to express the white pattern is inherited in accordance to a dominant model. 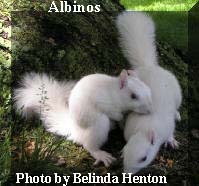 Albino squirrels appear to have a normal abundance and distribution of melanocytes; they just can’t produce melanin, period, skin or eyes; the subcellular structures where melanin is typically stored are empty (Searle, 1968). The leucistic condition can also be explained by interference in the normal develpment of these pigment producing cells. As they migrate and take up residence in the skin, the melanoblasts remain immature non-pigment producing cells. Normally they are destined to become mature pigment producing melanocytes under the influence of chemicals secreted by surrounding cells in the skin (fibroblasts and keratinocytes). Mutations are known (Wolpert et al, 1998:298) where these chemical inducers are altered or not recognized by the melanoblasts which remain immature (and thereby pigmentless) for life. Since this occurs locally in the skin after migration, it would not effect the normal induction of melanin production in the eyes. Variants that result from the lack of a receptor or chemical inducer, like those that result from non-functional enzymes as in albinos, are usually recessive. That is, all it takes is one normal version of the gene responsible and the wild type would be produced (credit victoria at http://www.dresshead). The unusual variant, in this case leucistic, probably requires a double dose, one from each parent although this has not actually been demonstrated. 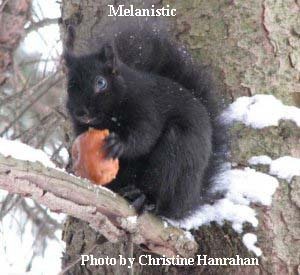 Finally, melanistic squirrels produce eumelanin in excess to that of the wild type, possibly under the influence of Melanocyte Stimulating Hormone from the pituitary. There is no a priori reason to think that this condition has to be recessive as suggested by Shorten (1945). There is no missing “ingredient,” only a change in proportions. 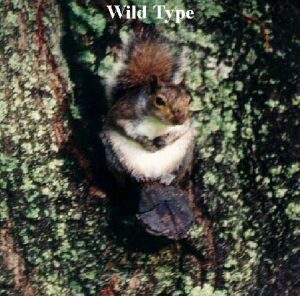 The fact that crosses between melanistic and wild type squirrels produces intermediate offspring as reported in Searle (1968) means that this trait is not recessive according to the classical definition. One additional variant should probably be mentioned here. Its not uncommon to observe a tan, ochre, or “blond” Eastern Gray Squirrel. This condition is thought to occur when eumelanin (black/brown in color) is “diluted” by a proponderance of phaeomelanin (yellow/red in color). There is some question as to whether the difference in color is due to an actual difference in the pigment polymers themselves or the protein matrix in which they are embedded (in the so-called melansome, an enlarged vesicle produced by Golgi bodies filled first with the protein matrix into which the polymerized pigment is later added). The usual stated chemical difference distinguishing the two pigment complexes is the presence of sulfur in phaeomelanin when the amino acid cysteine is readily available. Cysteine is the only sulfur bearing amino acid (amino acids being the building blocks of proteins). Sulfur bearing amino acids are capable of forming S-S cross bridges. Such availability of cysteine thus might be expected to change the nature of the protein matrix in which the pigments are embedded due to these cross bridges. According to Searle (1968), the protein matrix associated with the phaeomelanin complex is more condensed and less well organized than that which we refer to as eumelanin. The resulting change in the physical shape might account for the color shift. Any number of gene subsitutions (mutations) might account for this and it is surprising that this variant is not observed more often. Interestingly, the one shown here has a white tail. It is not uncommon to observe two tone squirrels but like the one shown here, it is usually the tail that is unpigmented rather than the body. Perhaps, that has to do with the smaller target (diameter of the tail) for migrating melanoblasts to find. Mating between coat color variants is probably random or non-assortative. Coat color is not nearly as much a factor as hormonal attraction. Squirrels have two breeding seasons per year, one in winter and one in summer; within those periods, each mature female will enter estrus on a different day but only for that one day. When a female enters estrus, interested males come from hundreds of yards away and camp out at her “door step” (outside her nest) before dawn without every seeing her coat color. Most accounts of “courtship”, itself, are brutal with little opportunity for females to be selective by any means, let alone coat color (Steele and Koprowski, 2001). Fortunately for her, she is only “receptive” and pursued by males for that one day during each breeding period. During that time, she may be impregnated by several different males, none of which help raise the young. That is one reason piecing together the genetics of coat color variation in squirrels is so difficult. Although it has been very successful in our area, it is rare elsewhere including its native Florida. Despite being widely distributed throughout central and northern Florida, this variant occurs in such low frequency that most Floridians are unaware of its existence (See discussion of Melanie in “Overview of Findings” post). However, they thrive in a few areas like Sopchoppy and the pecan orchard in Madison where our squirrels allegedly came from (for more on the Florida connection, see the “FAQ” post). Once introduced in Brevard, they have thrived here, as well, and in other areas into which they were released (e.g., Walkerstown NC). Perhaps the “Adam and Eve” translocated from Florida to North Carolina were unusually vigorous for reasons genetically correlated but not directly related to coat color. Or perhaps the visibility which we assume makes them vulnerable to predation actually protects them from a greater threat, the automobile. It’s also possible that predators, such as hawks, have “search images” that don’t match with white prey**. But why would that benefit populations in one area but not another. * Steppan, S.J., B.L. Storz, and R.S. Hoffman. 2004. Nuclear DNA phylogeny of the squirrels (Mammalia: Rodentia) and the evolution of arboreality from c-myc and RAG1. Molecular Phylogenetics and Evolution 30 (3):703-719 as reported on page 13 of Thorington and Ferrell (cited below). ** In this context, the following anecdote my have some relevance. A Brevard resident had visitors who brought their dog. Squirrels were very abundent in her neighbor and there are about equal numbers of white and gray. The dog regularly gave chase to gray squirrels but just stared at white ones. I live in Overland Park, KS, a suburb of Kansas City. I saw a cream-colored (very close to white) squirrel with a tan tail in a thickly wooded area near my home. I hope our local red-tailed hawk never sees him! This morning we saw a white squirrel in the woods back of our house. It was so exciting. Was not close enough to see any type markings but he did have what appeared to be a long and very bushy tail. Hopefully, we will have more sightings. Read your article and found it very interesting. In fact I live in Southern NH, Salem NH to be exact The folks in our small three block neighborhood have had the privilege of seeing white squirrels on and off for the past 4 years. We know that at one time there were as many as three which were reported seen together or near each other on more than one occasion. Unfortunately the sightings fell down to one and about two years ago I found that one dead in the road, apparently hit by a car. Was a very sad day. I am happy to say that about three months ago another one showed up in some large oak trees in the neighbor’s yard across the street from my house. I have seen it about a dozen times since. It shows up between 8am and 9am in the morning and then again in the early afternoon. It is all white. Have not been close enough to see its eyes yet. I was able to get a photo about a week ago. Do you know if it is genetic and possibly if it is bred into them. Could it be possible that the new visitor is simple an offspring of one of the initial three? I’m from Scottsville NY, I have seen a few white squirrels in my neighborhood but rare in certain blocks. they’re a bit ashen white colored not pure white. We have a white squirrel in our neighborhood in Winchester, MA currently, the first I have ever seen. A grey squirrel, completely white with black eyes. It interacts with other grey squirrels in what appears to be a typical way. We have had a very light blond squirrel in our yard this winter. I have lived here 30+ years and never saw one before. Beautiful! I live in Middletown, CT. The blond squirrel is feeding on my bird feeder now! Saw a white squirrel on our deck yesterday here in Michigan’s upper peninsula (Yooper country). Ironically, we put down our white German Shepherd three weeks ago. Animal reincarnation? I just saw a white squirrel with a pretty bushy tail today in overland Park, KS. wow, I didn’t know these exist! I live just outside and east of Athens Ohio. One year the woods next to my house had about half dozen all white squirrels and one particular squirrel was half white (waist up) and grey (waist down). I only saw them that one year and for just a few days, never seen any since then. Very strange. The half white squirrel looked like he/she was wearing a T-shirt. I have had a squirrel with white body, normal eyes and normal brown tail in the neighborhood for about 4 years now. I live in Trenton, IL and just moved into my house about 3 weeks ago and have seen a Blonde Squirrel that must live in the area. I thought i was seeing things but I saw it again for a longer period of time, soooo cool. I can’t wait to see it again and take a pic. A long time ago I saw an albino squirrel white with red eyes in the park near the college I attended, but I recently spotted a white squirrel with brownish -gray tail and ears plus brown eyes I took a photo as I ran out the road way. This spring my wife has seen three white squirrels’ one is completely white, one has just a brown head with rest body white and the third one has a black “Mohawk” on its top head and the rest of body white. This is the first type of white squirrels we have ever seen here in our Camden township residents. She feels very blessed to have seen them! June 4 , 2014 at 10:30 am. I have seen a white squirrel. Today running across a telephone line . I was really surprised . He was Beautiful. We have recently had a Grey squirrel with a snow white tail visiting our bird feeders next to the Geist Reservoir in Indianapolis, IN. Never had them before. I have pictures. I live in Moose Jaw, Saskatchewan, Canada and I have seen my very first white-tailed squirrel! Normal brown body colouring, but a pure white tail! Never have seen anything like it…thought I was seeing things! I was finally able to capture photos of him/her today (June 9, 2014) after many sightings. Just saw a squirrel with an all white tail here in Saint Charles, Illinois. Amazing!! This week I saw a pure blonde squirrel for the first time, in Novato CA. Not much info on the internet about them. We just spotted and videotaped a family of white eastern greys in our yard they are nesting..pine bluff Ar. Do you have a picture of this squirrel? If you do, please send to nancy@brevardnc.org. Can you send a picture of this squirrel? If you can, please send to nancy@brevardnc.org. Please forgive the delay in answering this request. We would love for you to share our content! 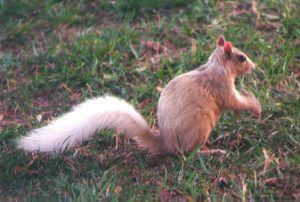 It’s a bit dated (as is this reply), but I found this article on white squirrels in Stratford, CT. Thanks for the videos. Are these squirrels still doing well?